Please send me more information on Baja Vision Project! 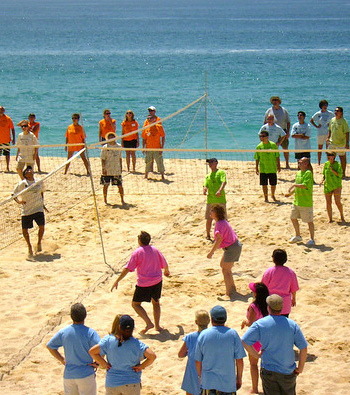 Baja Vision Project offers custom designed training programs, team building, vision development, corporate and incentive team events. 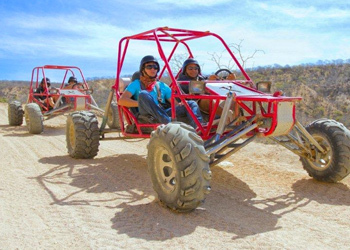 Baja Vision Project is a service company dedicated to providing experiential learning programs and instruction to any type of organization; corporations, educational institutions, governmental and NonProfit Associations. Our bilingual programs are portable in North America and Latinamerica. Our programs are customized according to the specific needs and intentions of our clients. 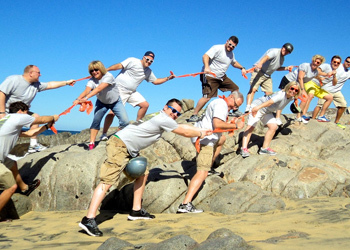 We focus on many different themes, including: team-building, conflict resolution, motivation, sales, change management and vision development! Teams will be given gloves and ropes and invited to 'rope joust' the opposite team by attempting to pull each other off of their balance point so they step off of their block onto the sand. Using buckets, members gather as much seawater as possible and bring it back to fill their tube. Members plug the holes with toes, fingers, noses, etc and compete for the fastest time to get the ping pong ball floated over the top of the tube. Teams will be given a huge pair of underwear (one pair fits three) and are required to perform a series of moves and run a course while wearing the underwear. 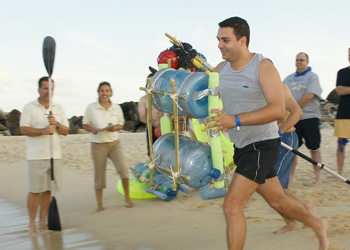 Teams must transport teammate from starting point to finish line before the other team – no touching the passenger or sand. 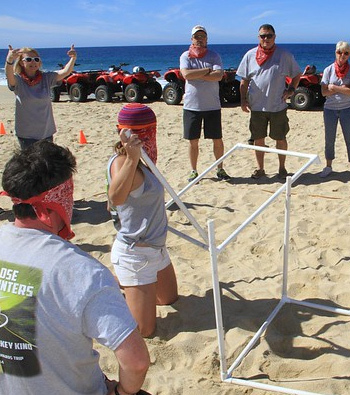 Teams must assemble PVC pipes into a perfect cube within a specified rope boundary. There will be very specific restrictions that make completing this project a very strategic challenge. Four (or 8) teams play 2 balls in every direction against each other simultaneously in four adjacent courts. Teams are challenged without one of their most critical senses to form a specific shape using their teammates and a huge length of rope. Given a set time limit, blindfolded participants are challenged to collect these items only with the help and guidance of their sighted teammates. Location: On or off property (transportation not included). Any hotel beach area or Public Beach with required authorization. Rates do not include sound system, refreshments, additional beach use or hotel fees. Each team will have a budget, time and plan to buy materials at a Marine Supple Store and then given the opportunity to strategize, design, build and race their rafts in the Sea of Cortez or hotel pool for a very fun and wet tournament! Location: On or off property (transportation not included). On Property: In select hotel pools. Off Property: At swimmable beach with proper authorization. Rates do not include sound system, refreshments, or additional beach use or hotel fees. 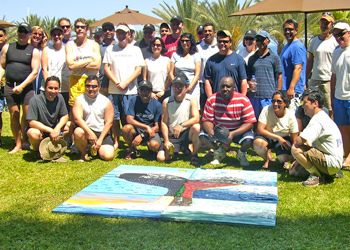 The team chooses an image (company logo, whale tale, etc) and is divided into equal sections – teams will plan and paint their portion of the image and then combine all canvases to make one finished piece. Location: On or off property (transportation not included). Divided into teams of two, you will race through the desert, down the arroyo, and out to the beach while finding different initiative stations where you will have to compete against other teams of riders. Teams of 5-6 people try to come up with the most creative, theme based photos they can create. The Project: Teams will be required to get together and strategize their photo projects, according to the vision themes. The Focus: Each team is given a list of themes/subjects designed to reflect the vision or intention of your company. It is up to you to plan and execute competing against other teams to come up with the best/funniest/strangest/coolest/most creative image possible. Note: Many additional activities available – call for details!